My husband and I both enjoy soup especially as the weather starts to get cooler. 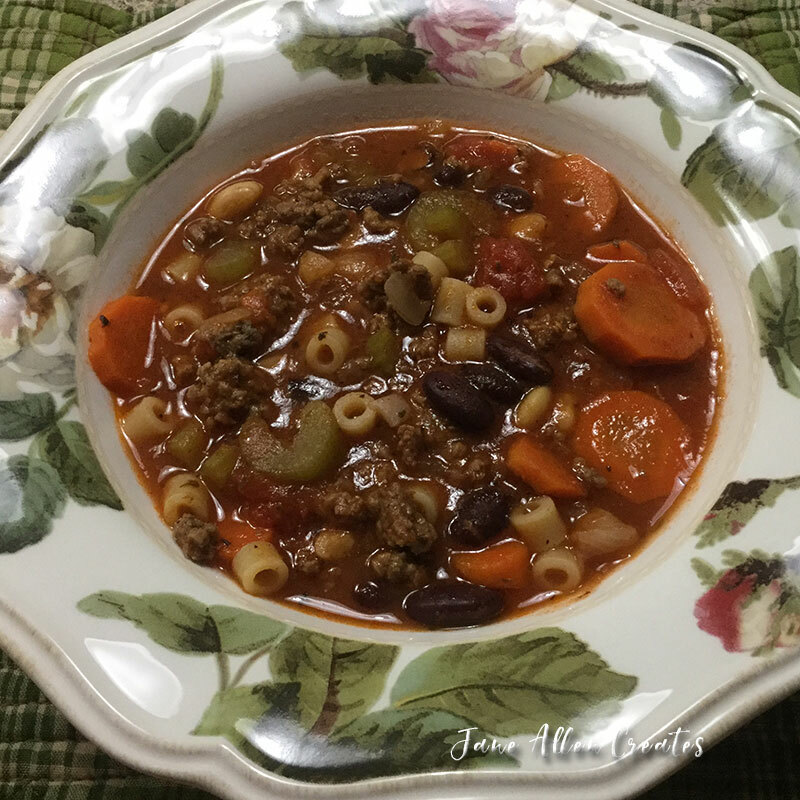 When I had originally found this recipe it was to have been as good as Olive Gardens Pasta E Fagioli soup. I love Olive Gardens pasta fagioli soup so I had to try this one. I have made a lot of tweeks to the recipe and it still does not taste like Olive Gardens, but I think it is a good hearty soup and easy to make. I hope you enjoy it. Brown the ground beef in a large saucepan or pot over medium heat. Drain off most of the fat. Add onion, carrot, celery and garlic and sauté for 10 minutes. Add remaining ingredients, except pasta, and simmer for 1 hour. About 50 minutes into the simmering, cook the pasta in 1 1/2 to 2 quarts of boiling water over high heat. Cook for 10 minutes or just until pasta is al dente, or slightly tough. Drain. Add the pasta to the large pot of soup. Simmer for 5 to 10 minutes more and serve. This soup tastes great with my French Rolls. I have also updated my roll recipe so that you can now enjoy a multi-grain version.